WARNING: Not All Pest Control Treatments Are The Same! Some will rush in and out in 5 minutes doing a poor job. Don’t risk it! We take the time to give you the best treatment possible. 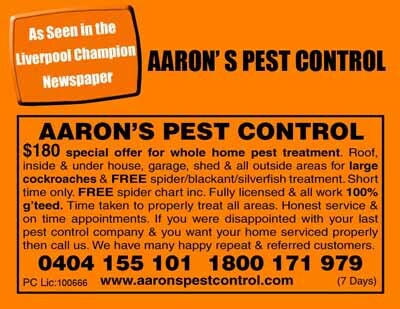 Aaron’s Pest Control services Heckenberg, NSW. Our mission is to provide our customers with quality service and superior results from our pest treatments. By using our services we can make your living and working environment a much safer place and at the same time reducing health risks to you, your loved ones, friends and co workers. We can also follow you up with a reminder postcard in the mail for when your home is due to be serviced next. This takes the guess work away from you as to when your pest control treatment is due next and gives you peace of mind that Aaron’s Pest Control won’t let you down. We can treat all types of premises. Our pest control services include Residential homes, rental properties, commercial industral buildings, offices, town houses, units, flats, doctors surgery, schools, child care centres, shops, cafes and more. 7 Reasons To Choose Us! You’ll get the most thorough pest treatment you’ve ever had to all areas of your home and there’s no stinky smells or odours! You’ll save money with this special offer and the FREE bonus gift! No rip off charges. Just genuine honest service and great value for money! We have lots of very happy repeat and referred customers who continue to use and recommend our business! We’ll look after you, because we know that if you’re really happy with our service you’ll use us again and again and tell your friends and neighbours for us too! We arrive on time, not 4-6 hours later! We are experienced, fully trained, licenced, accredited and comply with Australian standards for pest control. Pest Control Licence No.100666.